The forage and weather has been so good in southern England this season that I had to call into action some dubious supers. The bees objected to the gap between two supers and called in the propolis. They may only be a small nucleus, but they have a double line of defence for the wasps taht dare encroach upon the hive. Here is the advanced guard attacking a would-be intruder wasp. I only just managed to glimpse the wasp once in this tangle of bees. Meanwhile at the door, the guards are lined up ready for more intruders. Not all bees can be quite so effective against wasps, but this little nuc certainly has what it takes. And yet they are very calm during inspections. Because the stings of honeybees’ stingers can’t usually penetrate a wasp thick outer skin, the bees form a ball around it and use their vibrating flight muscles to raise the temperature around the victim to about 47 degrees Celsius, enough to kill it! Death by baking! The original bake-off! If you want to help your bees defend against wasps and hornets – especially the Asian hornet, try Vita’s Asian Hornet trap, Apishield. A mystery disease that baffles researchers is being more commonly reported. It has eluded a treatment, but a British beefarmer has tried an ingenious method that seems to give some measure of control. 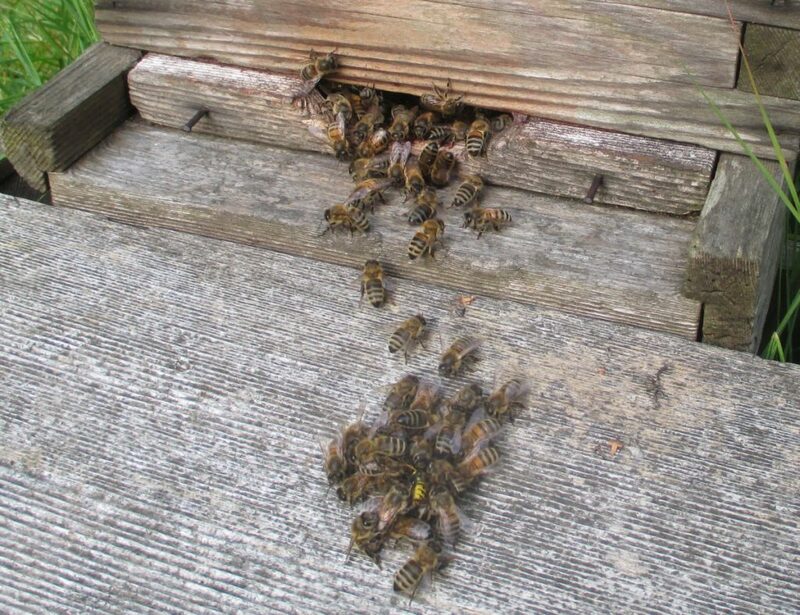 Chronic Bee Paralysis Virus (CBPV) causes honey bees to have symptoms that include trembling of wings and body, jumpiness, loss of flight, loss of hair, and rejection by healthy members of the colony. It can contribute to the death of a colony. Apparently, the virus has also been found in two species of ants and even varroa. Chris Neel, in the UK Bee Farmer journal (April 2016), found CBPV in four of his colonies in 2012. Two were too far gone to recover and he followed the then conventional advice to requeen the other two colonies which then recovered. Two years later in a different apiary 40 km away, CBPV showed up again. Research by then had indicated that bee-to-bee contact transmitted the disease, so Neel hatched a cunning plan. He caged the queen and separated her from the colony. He then moved the brood box 50 metres away and took out the frames, but returned the beeless box to the original stand after scorching the inside to sterilise it. 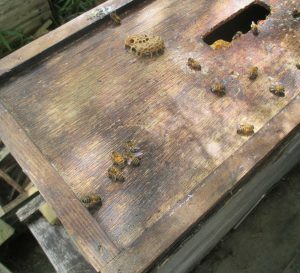 He then shook every last bee from the frames (50 metres away) and the bees that could fly returned to the original brood box site. He was careful not to let the bees mingle on the ground which might have aided further bee-to-bee transmission. So, the healthy flying bees returned to the original spot and the queen re-introduced. The CBPV bees, incapable of flight, did not return to the colony. He cl;eared up the dead and dying bees in the vicinity so that further reinfection could be minimised. The colonies survived and went on to produce a good harvest. The UK National Bee Unit has video of bees with CBPV. 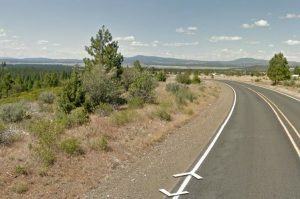 I’ve just discovered a fascinating new site featuring Google Earth’s Street View. You have to guess where in the world the Street View location is – and for added beekeeper fun, you can ponder if it’s a good place for an apiary. Googleguessr is the brain child of a Swedish IT consultant Anton Wallén. Hint: The locations over-represent developed countries, because of Google’s street car reach. If you aren’t careful it will give you hours of fun. It’s rather addictive! So is your view apiary heaven or hell? Honey bees never fail to bamboozle me. A colony with a newly-laying queen has emerged from next to nothing. Two queen cells casually left on their sides on the cover board of the nucleus. One turned out to be empty, as if the queen had emerged. The other contained the remains of a developing queen. There were several queen cells on the frame, so I removed two without destroying them and placed them on the cover board of the transported nucleus. Meantime I inserted the frame with bees in the observation hive. The original nucleus was put in its usual outdoor storage space. I noticed that a very few (twenty?) bees stayed with the nucleus and the sealed queen cells, but I thought little of it expecting them to abandon the lost-cause colony in a day or two. A couple of weeks later, I noticed some early morning activity around the nucleus while another nearby colony had yet to make an appearance for the day. I thought that was curious, but didn’t investigate immediately. The activity around the no-hope colony steadily increased over the next few days and today I investigated, thinking that a swarm must have entered. In fact the tiny colony has a laying queen – she has just started to lay eggs – and a great many more bees than it started with! From a start of twenty, the bees probably number in the very low hundreds. But the queen didn’t lay them – she has only just come into lay. So, the extra bees must be volunteers or recruits from other colonies! Why would some bees leave their populous homes to pioneer with this minute colony? I have considered the possibility that a very tiny caste colony has moved in, but that doesn’t quite fit. Firstly, the increase in activity over many days has been gradual rather than sudden. Secondly, of the two queen cells left on the cover board, one still has the remains of a queen, but the other is empty as if that queen has emerged. Today, the colony is doing very well. They are building comb on frames that were destined to receive new foundation. 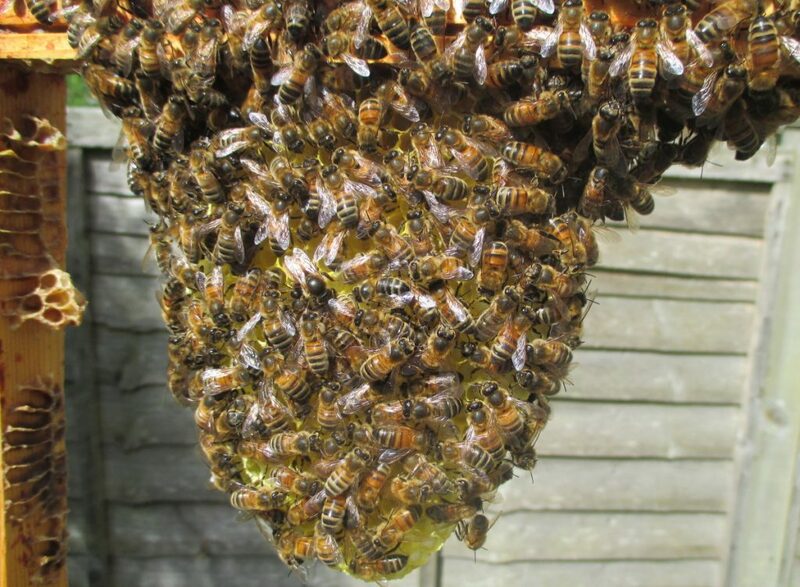 The photo below shows the queen, the new comb and is half the colony that started with about twenty bees! The new queen’s thorax is visible just left of centre in the middle of the photo. This is one frame of the now two-frame colony.